Click to enlarge. 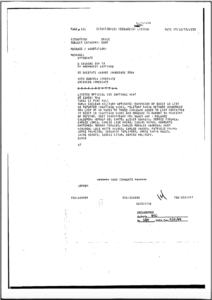 A document that the U.S. government received from Chile the day after the coup with the names of individuals wanted by the Chilean Ministry of Defense. My grandfather is on the list, as well as on the list of more than 7,000 individuals in the Manuel Contreras lists. Source: U.S. National Security Archive, George Washington University. In a matter of days Chile went from vibrant democracy to closed society after the military coup of 1973. The junta consolidated power by disappearing, killing, imprisoning, and torturing its opponents following the death of democratically elected Socialist President Salvador Allende. Eighteen years of military rule left thousands dead and tens of thousands tortured. At the time, my maternal grandfather, Carlos Matus, was Minister of the Economy and President of the Central Bank of Chile, serving under Salvador Allende. The armed forces arrested my grandfather two days after the coup and shipped him off to the southern tip of Chile, to a concentration camp on Dawson Island in the Strait of Magellan, Tierra del Fuego. He soon realized that the military was rounding up cabinet members from the recently deposed administration, as well as anyone associated with Popular Unity, the coalition of political parties that brought Allende to power. Within days the assault on Chilean democracy became much more generalized. Civil society and the political elite demobilized, went into hiding or left the country, if they had not already been arrested or killed. By the late 1970s extremists and proponents of armed action gained traction because of the perception that violence was the only option to fight such a repressive government. The Patriotic Front Manuel Rodríguez (FPMR) became an increasingly powerful armed group in Chile, with soldiers trained by the Cuban Armed Forces in Havana and with war experience in Nicaragua alongside the Sandinistas, as well as in Colombia with the FARC. Inter-communal tensions heightened across Chile as radical right-wing Pinochet supporters, organized through the paramilitary group Fatherland and Liberty, harassed communities that had historically supported Allende. This conflict did not escalate into civil war or large-scale political violence, however. Chile transitioned back to democracy after waves of largely peaceful protests from 1985 to 1989 and a national referendum in 1989 that the military upheld under great pressure. This question—of why large-scale political violence did not eclipse other forms of opposition in Chile and instead nonviolent opposition organizations gained traction—has intrigued me for a long time. How did Chile return to democracy through a largely peaceful effort from below after so much state violence? Driven in large part by my family history to pursue a dissertation on civil resistance, my research examines three questions that derive from this puzzle. First, why do some dissident groups remain resilient in the face of extreme government repression while others get eliminated? Second, what are the conditions under which new opposition groups emerge as a consequence of state repression? And finally, how does a mass protest movement emerge from the disconnected efforts of hundreds of opposition groups to form unified and sustained mobilization? To answer the question about resilience to repression, I created a dataset that compiles the names of more than 7,000 individuals on the Chilean government’s 1973 kill lists, along with their political affiliation and an indicator for whether or not they were eventually victimized, according to the three Chilean truth and justice commissions. I demonstrate that a specific organizational structure and the ideological position of the opposition group vis-à-vis the state help explain the differences in survival rates across opposition groups. 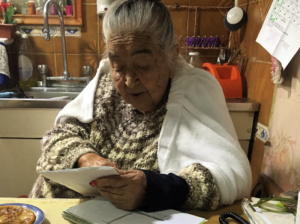 Ana González de Recabarren, one of the leaders of the Association of Family Members of Disappeared-Detainees, during an interview in her home in Santiago (April 2017). Her husband and two sons were taken from her home in 1976 and never seen again. Source: Author. The benefit of this dataset is that I have the intended-to-repress population and the victimized population in Chile, which allows me to estimate the extent to which various opposition groups were able to curb repression that was intended toward them. I was able to find these lists at the Museum of Memory and Human Rights in Santiago, in a publication by Manuel Contreras Sepúlveda, the head of the secret police (DINA) from 1973 to 1977. 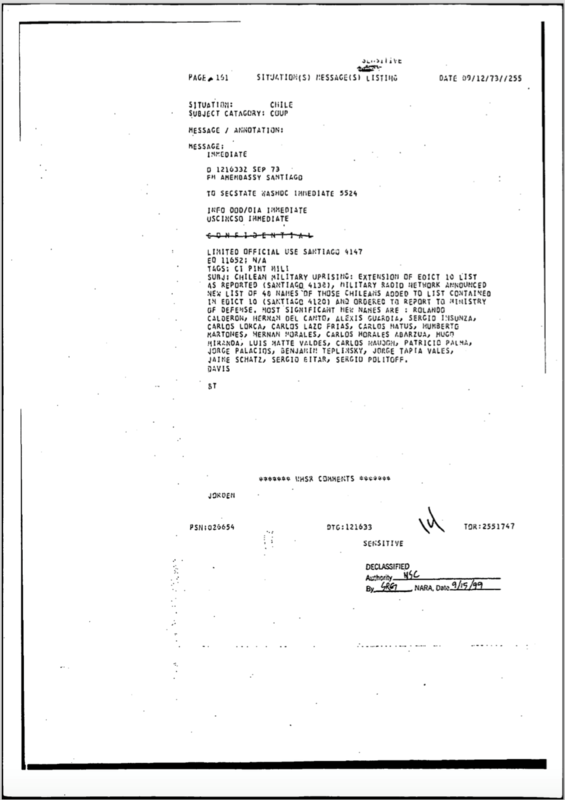 Documents from the National Security Archive in the U.S. helped me cross-reference these lists as well, because at the time the United States was working closely with the coup plotters. My grandfather’s name is on these lists, along with details such as the day they arrested him, the location, and the fact that he turned himself in, further boosting my confidence in these materials. The second part of the dissertation demonstrates that what I call protector institutions—in this case the Catholic Church—are key to explaining the emergence of new opposition against the military dictatorship. In areas where protector institutions were lacking, such as in villages where the local parish was right-wing and pro-Pinochet, opposition groups were unable to form, even though I have evidence—through extensive personal interviews—that various communities attempted to do so. Further, I show the effect of protector institutions more systematically by geo-coding all the parishes in the most populated state in Chile, along with the political leaning of the temple’s leadership, and whether or not an opposition group emerged in the area. I do the same across Chile at a higher level of analysis, by coding the political leaning of all the bishops in Chile and the location of where new opposition groups emerged. This part of the dissertation emerged from extensive interviews with the families of the disappeared, as I learned about how their opposition movement was growing and remained resilient while most other efforts had been shut down. Finally, rather than studying Chile as a single instance of a mass nonviolent movement that succeeded in overthrowing the Pinochet dictatorship in 1989, the third part of my dissertation shows, with a dataset of more than 900 opposition groups, that the opposition to the military dictatorship was far more diverse. Importantly, it was not a given that a nonviolent streak would gain the momentum it did and effectively prevent more widespread political violence. I demonstrate that civil society organizations with narrow and unthreatening objectives were the most important intermediary between a dispersed opposition and the consolidation of a potent mass movement. Neighborhood associations, soup kitchens, health and educational programs, and victims’ groups allowed many people to weather the economic, social, and political setbacks of the Pinochet era. Chileans did the groundwork for future peaceful change through these organizations while mitigating regime violence and making armed unrest less likely. Over a third of the population worldwide lives under authoritarian rule. In response to—or in anticipation of—popular unrest, dictators redouble their efforts to crackdown on dissent. Citizens nonetheless organize under these difficult circumstances, and in many cases they are able to sustain mass movements. I hope that by comparing the successful with the unsuccessful attempts to organize against Pinochet in Chile, we can learn about how civil resistance works and is sustained under repression. Featured image: Detainees in Dawson Island. A Red Cross worker who was able to gain access to the camp captured this moment. My grandfather is the 7th man from the front, on the left-hand side. Source: Chile’s Ministry of Defense, http://www.defensa.cl/temas-principales/isla-dawson/. Consuelo Amat is a Ph.D. candidate in Political Science at Yale University and a USIP Jennings Randolph Peace Scholar. 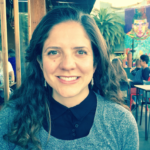 Consuelo studies state repression, civil society development, and nonviolent and armed resistance. Her past professional experience includes working at the Brookings Institution and at the International Center on Nonviolent Conflict.